There are a number of varieties of ginseng that include Chinese / Korean Ginseng, American Ginseng (Panax quiquefolius), and Siberian Ginseng. What Is Ginseng Good & Used For? Chinese / Korean ginseng (Panax ginseng) is more of a stimulant and men's sexual health herb while American ginseng may be more active as an adaptogen. The benefits of Ginseng include the regular usage by Russian cosmonauts and Asian Olympic athletes as an energy booster and adaptogen tonic, since it increases resistance to all types of stress of both biological & physical origin. Panax ginseng is also highly regarded for reducing fatigue and improving alertness, coordination, memory, and stress-coping abilities. (Duke, James A., The Green Pharmacy (Emmaus, Pa.: Rodale Press, 1997), 132-33. Ginseng root contains active constituent called ginsenoside that is used for invigoration and fortification during fatigue and disability, as well as for declining capacity for work and concentration. Higher ginsenoside will increase energy naturally while enhance stamina in both mental & physical condition. Ginsenoside from Panax ginseng has shown significant inhibitory effects against platelet activating factor (PAF), which is involved in many inflammatory and allergic processes. 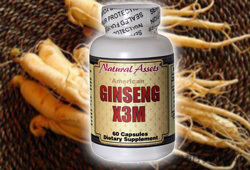 Panax ginseng along with other energy vitamins & nutrients are featured in Natural Assets' Formula for Super Energy & GinsengX3M. Click here for more information. Other researchers found the Panax ginseng is a pulmonary vasodilator that protects the lungs in animals against free radical injury (Rimar, S., et al., "Pulmonary Protective and Vasodilator Effects of a Standardized Panax Ginseng Preparation Following Artificial Gastric Digestion," Pulmonary Pharmacology 9; 205-09, 1996). including promoting adaptation to climatic extremes of heat, cold and altitude; increasing workload; improving visual and aural acuity, and protecting against depression. Siberian Ginseng extracts have been traditionally regarded as one of the potent endurance & energy supplements, fatigue natural cures, and anti stress nutrients. Modern research has shown Siberian Ginseng to be a stimulant with powerful antioxidant and stress-resistant qualities. It is widely reported to build resistance to the affect of both physical & mental stress. Siberian ginseng is still used in Russia as an energy vitamin, diabetes therapy, radiation exposure protection, cancer suppression, and potency enhance for some types of chemotherapy. Siberian ginseng along with other natural herbs are featured in Formula for Women. Click here for more information. Compared to Panax Ginseng, North American ginseng is said to be "cooler" and has more relaxing effect and less stimulating, while thought to be more appropriate for counteracting the stress experienced by overworked and burn-out. It also helps in emotional & physical fatigue while naturally strengthen immune system, improve concentration, increase male libido, and provide antioxidant actions. Researches also have shown that American Ginseng may help maintaining normal range blood sugar levels by making the cells more receptive to insulin in people who are insulin resistant. Consuming large amounts of caffeine or other stimulants while taking ginseng can result in nervousness, sleeplessness, elevated blood pressure, and other complications. People with hypertension (high blood pressure) should be aware of the potential side effects of ginseng due to the possibility that it may raise blood pressure. How to increase sexual stamina? Take ginseng along with other well-researched natural herbs and nutrients that are featured in Natural Assets' Formula for Men. Click here, for more information. Encyclopedia of Nutritional Supplements, Michael T. Murray, N.D., Prima Health (A Division of Prima Publishing), 1996.